Large families prefer the Chevy Tahoe due to the vehicle's abundance of interior space. The versatile SUV is also a great vehicle to have when needing to carry a lot of cargo or desire to pull a trailer. However, the latest technological features offer entertainment and safety. Meet the 2019 Chevy Tahoe and explore the options at our Salem showroom. The infotainment system exists in one neat cluster in the middle of the dashboard. The eight-inch touchscreen provides instant access to climate control, music options, smartphone links and navigation instructions along with displaying the time and exterior temperature. Drivers need never take their eyes from the road with the convenient heads-up display that appears on the windshield. 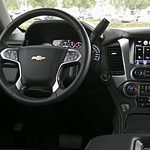 Tahoe owners also have the option to include rear-seat entertainment systems and screens that enable passengers to play their favorite Blu-ray DVDs or music selections. Check out the many other features that the Tahoe possesses by visiting us at Capitol Chevrolet.